The genomic framework that enables corals to adjust to unfavourable conditions is crucial for coral reef survival in a rapidly changing climate. We have explored the striking intraspecific variability in the expression of coral pigments from the green fluorescent protein (GFP) family to elucidate the genomic basis for the plasticity of stress responses among reef corals. We show that multi-copy genes can greatly increase the dynamic range over which corals can modulate transcript levels in response to the light environment. Using the red fluorescent protein amilFP597 in the coral Acropora millepora as a model, we demonstrate that its expression increases with light intensity, but both the minimal and maximal gene transcript levels vary markedly among colour morphs. The pigment concentration in the tissue of different morphs is strongly correlated with the number of gene copies with a particular promoter type. These findings indicate that colour polymorphism in reef corals can be caused by the environmentally regulated expression of multi-copy genes. High-level expression of amilFP597 is correlated with reduced photodamage of zooxanthellae under acute light stress, supporting a photoprotective function of this pigment. The cluster of light-regulated pigment genes can enable corals to invest either in expensive high-level pigmentation, offering benefits under light stress, or to rely on low tissue pigment concentrations and use the conserved resources for other purposes, which is preferable in less light-exposed environments. The genomic framework described here allows corals to pursue different strategies to succeed in habitats with highly variable light stress levels. In summary, our results suggest that the intraspecific plasticity of reef corals’ stress responses is larger than previously thought. Yesterday’s excellent Australian Pathogen Bioinformatics Symposium 2014 (#APBS2014) reminded me that this post was a bit overdue: originally posted at the UNSW Science Wavelength blog on October 30, 2014. Following APBS2014, we are also looking into how we can identify which other pathogens might be using a similar strategy. Every living cell is packed full of tiny molecular machines. Many of these machines are made from proteins: assembled chains of amino acid building blocks, which twist, wrap and fold up into complex three-dimensional shapes. The way that these machines interact with each other, and other molecules in the cell, ultimately determines how a cell behaves, divides (or not) and dies. Viruses hijack this cellular machinery and reprogram it to their own ends using their own set of proteins. Many viruses are tiny, with genomes that encode only a handful of proteins, and yet they need to take control of a multitude of host processes. The way that they achieve this is by mimicking small host interaction motifs called SLiMs (short linear motifs), which are the focus of study in my lab. For example, some viruses use the host DNA replication machinery for their own replication and mimic a SLiM that interacts with an important cell cycle checkpoint protein called retinoblastoma. By mimicking the retinoblastoma-binding motif, the virus tricks the cell into entering the DNA replication phase of the cell cycle. Other SLiMs are mimicked to prevent host cells committing suicide through a process called apoptosis, or to hijack cellular transport machinery and get the viral proteins to the right place. My lab is a bioinformatics group, using computational tools to analyse biological data. As their name suggests, SLiMs are very short regions of the protein chain that have a small number of specific amino acids in specific linear configuration that enables them to interact with particular proteins in the cell. Not all protein folds up into complex shapes; SLiMs are generally found in regions that remain in a flexible, linear “intrinsically disordered” state. This means that we can potentially identify SLiMs by careful examination of the protein “sequence”: the precise composition and order of amino acids from a pool of twenty common types, as encoded by the DNA. This is challenging because one stretch of protein looks much like any other when written as a string of letters. In reality, these letters represent chemical groups with distinct properties and so our tools also consider evolutionary and structural signals in the data. My background is in genetics and I consider myself an evolutionary biologist at heart. The famous adage of Theodosius Dobzhansky, “Nothing in biology makes sense except in the light of evolution” is particularly true of sequence analysis. 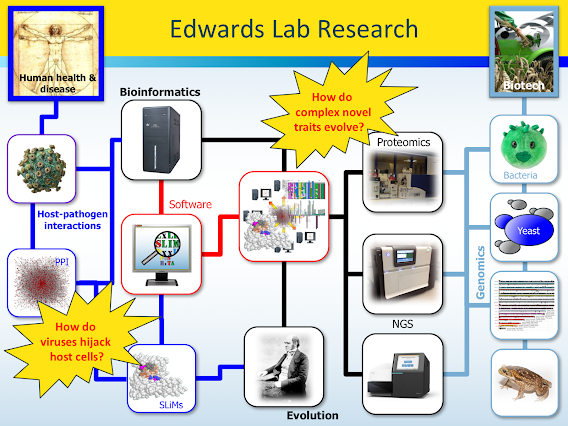 The evolutionary process leaves clues in the sequences and it is those clues that my lab seeks to exploit. Many people are familiar with the concept of evolutionary conservation, in which functionally important traits (or sequences) are maintained through time by natural selection. Mutations of these sites are detrimental to reproductive success and do not have a long-term future in the population. By aligning and comparing proteins that share ancestry, it is possible to identify regions and sites under such constraint as those that have not changed. 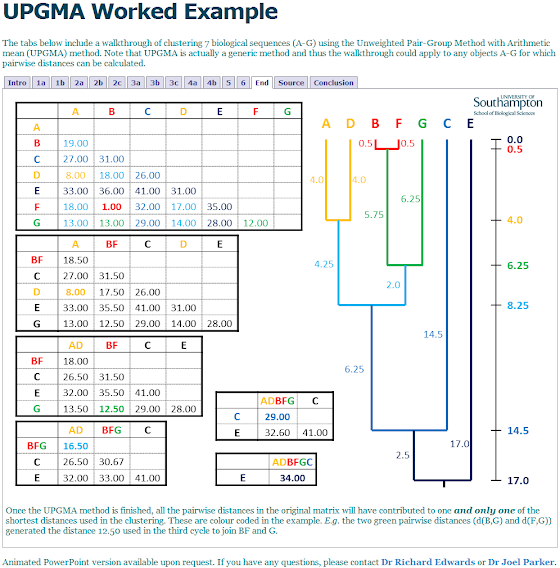 However, there is an important time component with such analyses; whilst some sites will be unchanged due to constraints, others may simply reflect shared ancestry with insufficient time to accumulate mutations. Conservation alone also says nothing about the function of the conserved site and there are many functional and structural constraints that would drown out any signal left by very small functional elements like SLiMs. For SLiM discovery, we also harness a second evolutionary process: “convergent” evolution, in which the same trait independently arises on a different background. In the context of SLiMs, a specific configuration of amino acids is independently acquired by proteins that do not share identifiable common ancestry. Because SLiMs are so small and involve so few positions, a single amino acid substitution can create (or destroy) a SLiM in a protein, which is precisely how viruses are able to stumble across useful host motifs. If useful, such accidental discoveries are captured by natural selection. We identify candidates for convergent evolution as sequence patterns that are over-represented in a set of otherwise unrelated proteins that interact with a common partner protein. To identify molecular mimicry, we make use of experimental data in which a viral protein has been shown to interact with a human target protein. We look for sequence patterns that are found in the viral protein and enriched in the human proteins that interact with the target. We still have a long way to go but if we can work out how viruses are disrupting the cellular machinery of their hosts, we might be able to work out how to stop them. Emily Olorin joined the lab on 1st December 2014 on a summer vacation research scholarship. Her primary project is to update the SLiMScape App for the latest release of Cytoscape. 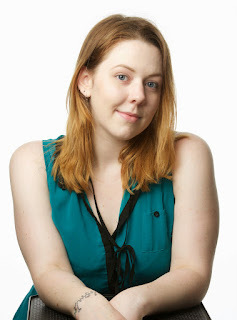 Emily previously worked as part of the Cysique research group at NeuRA and for Google as an Engineering Practicum Intern. Her research interests include short linear motifs (SLiM) in proteins, as well as MRI analyses. Good luck Nico and Armella! All good things come to an end and so the Edwards lab bids a fond farewell to Dr Nico Palopoli (outside left) and Armella Zadoorian (inside right) who have recently left the lab. Nico returns to his homeland of Argentina today to take up a new position, whilst Armella’s internship came to an end last week and is getting ready for exams. Hopefully, Ranjeeta (outside right) won’t get too lonely without them. Poster 17: Molecular mimicry in viruses and cancer. 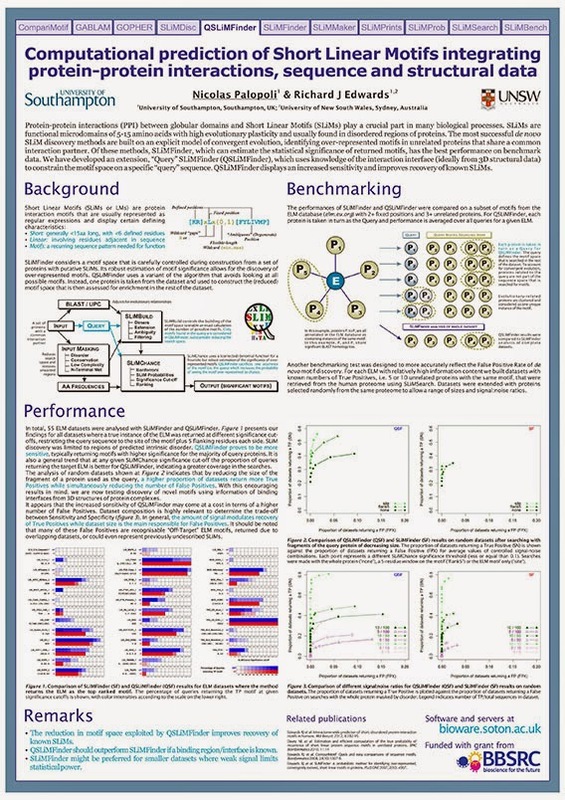 Poster 29: Computational prediction of protein interaction motifs from integrated protein sequence, structure and interaction data. Come and check them out if you are in the Garvan on the 13th and 14th. Congratulations to the #ABiC14 team for a fantastic conference! 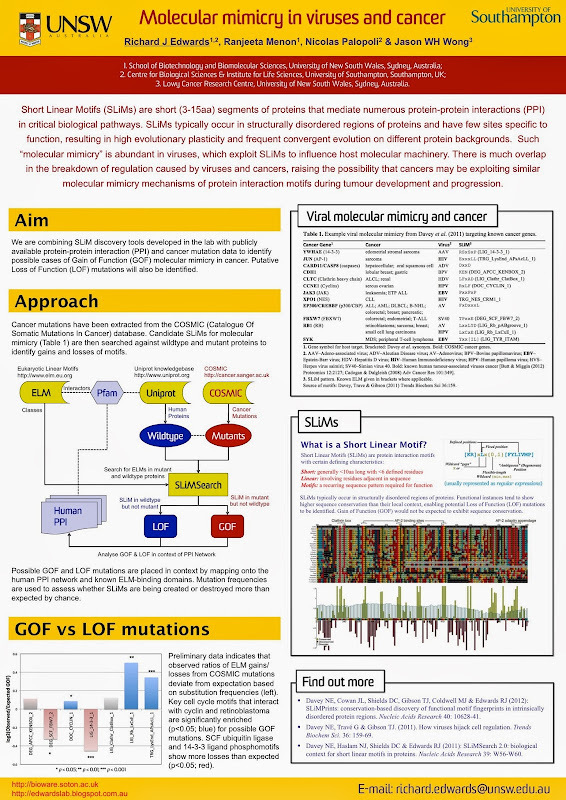 The Edwards Lab had a couple of posters at the Australian Bioinformatics Conference (ABiC 2014) (see here and here). It was a great conference and really set the bar for future bioinformatics conferences. I’ve posted some reflections on what made ABiC 2014 so good over on my personal blog but wanted to reiterate my thanks and praise to the ABiC 2014 Committee for such a great meeting - and to encourage attendance of ABiC 2015, should there be one! More details of the meeting can be found at the ABiC 2014 conference website and the #ABiC14 twitter stream. Poster 45: Molecular mimicry in viruses and cancer. Poster 46: Computational prediction of protein interaction motifs from integrated protein sequence, structure and interaction data. Protein-protein interactions (PPI) between globular domains and Short Linear Motifs (SLiMs) play a crucial part in many biological processes. SLiMs are short stretches of 5 to 15 amino acids with high evolutionary plasticity that are usually found in disordered regions of proteins. Their role as ligands for molecular signalling, post-translational modifications and subcellular targeting has been increasingly studied over recent years, but experimental discovery of SLiMs remains a challenging task due to their small size and high degeneracy. As a consequence, computational tools for prediction and analysis of SLiMs are a valuable resource. We have previously developed SLiMFinder, a motif discovery tool that applies a model of convergent evolution to estimate the statistical significance of over-represented motifs with high specificity. Here, we aim to improve motif discovery by integrating SLiMFinder with methods that predict new domain-motif interactions directly from structural features in high-resolution 3D data. To this end we have developed “Query” SLiMFinder (QSLiMFinder), which uses knowledge of the interaction interface to constrain the motif search space and thereby increase search sensitivity. 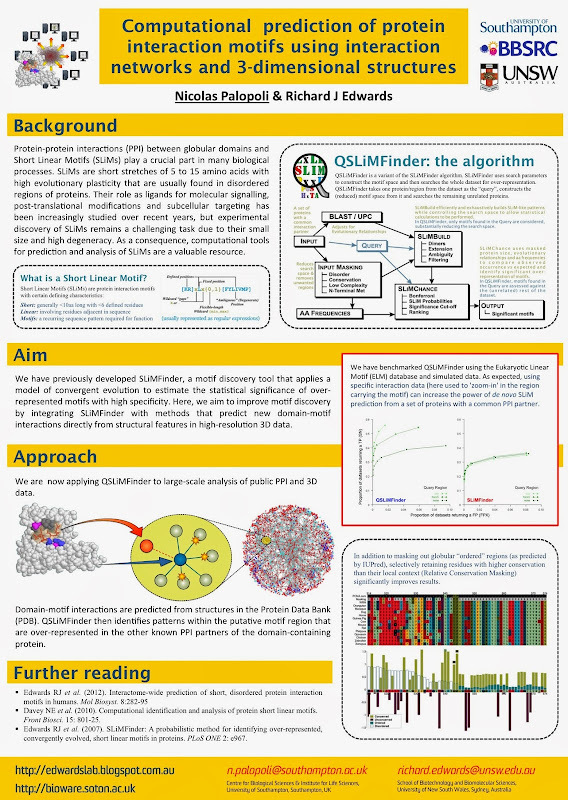 We have benchmarked QSLiMFinder using the Eukaryotic Linear Motif (ELM) database and simulated data. As expected, specific domain-motif interaction data can increase the power of de novo SLiM prediction from a set of proteins with a common PPI partner. We are now applying QSLiMFinder to large-scale analysis of public PPI and 3D structure data. Domain-motif interactions are predicted from structures in the protein data bank (PDB). 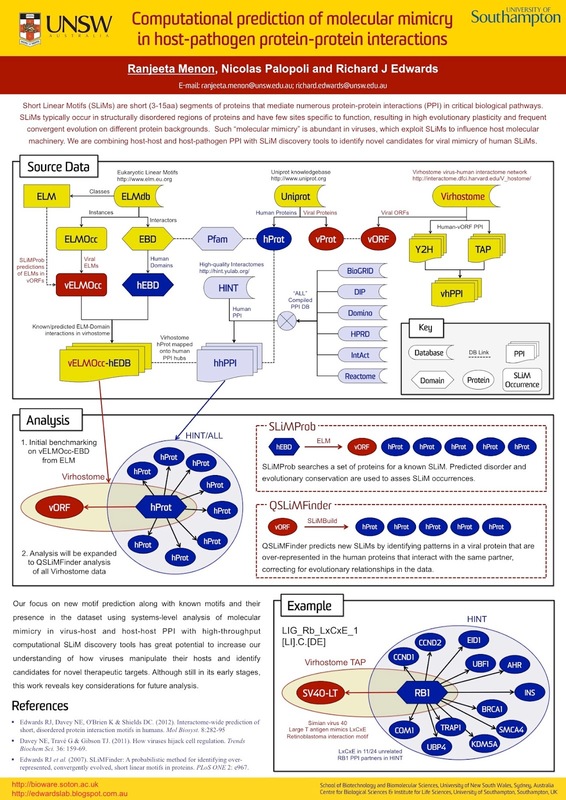 QSLiMFinder then identifies patterns within the putative motif region that are over-represented in the other known PPI partners of the domain-containing protein. 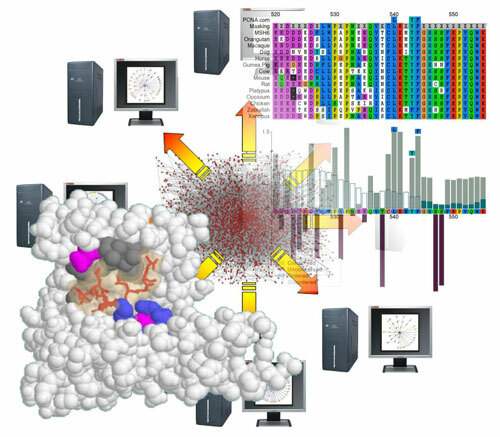 This will add crucial molecular details to the interactome. Molecular mimicry is a well-established example of convergent evolution by which viruses evolve protein motifs that interact with host molecular machinery to hijack cellular functions. These short linear motifs (SLiMs) have only a handful of critical positions and a single point mutation is often sufficient to create or destroy a motif occurrence. This may have direct effects, such as eliminating a key regulatory interaction, or more subtle indirect effects by altering/blocking neighbouring interactions. There is much overlap in the breakdown of regulation caused by viruses and cancers - including oncogenic viruses - and so it is likely that many cancers are exploiting similar molecular mimicry mechanisms of protein interaction motifs during tumour development and progression. We are combining publicly available datasets of host-host and host-pathogen PPI with recently developed tools from the SLiMSuite package to (1) identify novel candidates for viral mimicry of known host SLiMs, and (2) predict entirely new SLiM classes. In each case, signals of convergent evolution are identified using statistical over-representation of motifs in unrelated proteins. We are also using SLiM analysis tools to identify putative gain- and loss-of-function mutations from public cancer mutation databases. SLiM predictions and mutations will be placed in context using the human protein-protein interaction network and cross-referenced to known viral molecular mimicry and proteins/pathways affected in cancer. Simulated mutation data will be used to test for possible enrichment of mutations that create or destroy SLiMs. SLiMSuite Short Linear Motif discovery and analysis: Blog switchover: Posts and pages from the old SLiMSuite and SeqSuite blog have now been imported and this blog will take over as the main source of ongoing news, tips, documentation and updates. Nicolas Palopoli & Richard J Edwards (2014) Computational prediction of short linear motifs integrating protein-protein interactions, sequence and structural data. F1000Posters 5: 407. We have previously presented SLiMFinder, a motif discovery tool that applies a model of convergent evolution to estimate the statistical significance of over-represented motifs. In this project we aim to improve motif discovery by integrating SLiMFinder with methods that predict new domain-motif interactions directly from structural features in high-resolution 3D data. To this end we have developed “Query” SLiMFinder (QSLiMFinder) which uses knowledge of the interaction interface to constrain the motif search space and thereby increase search sensitivity. Using putative SLiM-carrying regions extracted from protein structures as queries and targeting data from public protein-protein interaction databases, we applied QSLiMFinder to find over-represented recurring sequence patterns from proteins that all share a common interaction partner. Benchmarking of QSLiMFinder shows that specific domain-motif interaction data help in finding novel instances of known motifs or entire de novo SLiMs, improving over results returned by PPI data alone. SLiM discovery capitalizes from the availability of experimentally identified PPIs with high-quality predictions of the interacting sites. The methods developed here help to enhance annotation in public databases of SLiMs and could be used to mine new PPI data as it becomes available, adding molecular detail to interactome networks.